Success in retail depends on your ability to stand out from the crowd. With the spread of C-store chains and hyper-marketers, that's more important than ever. We believe that there's no more cost-effective way of raising your profile than joining forces with Liberty. At Liberty, we've worked hard to build and maintain a distinctive brand that's nationally recognized for quality. Our stars and stripes image says it all: Liberty operates in the finest American tradition of service and value. It's a first-class brand that attracts customers and builds loyalty over the long term. 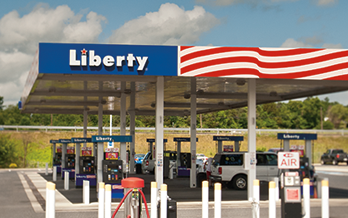 Every Liberty gas station proudly displays the American flag! The Liberty brand is nationally recognized for quality. "Customers love our patriotic image and come back for our low prices. We have tripled our volume after converting from a major brand and our margins are consistently excellent. I can't ask for anything better." "We were looking for an image that would set us apart from all others and compete with the majors. The patriotic Liberty brand met our needs."